Organisms that need any kind of extreme conditions to complete their life cycle are called extremophilic. That can be, e.g., elevated (thermophily) or lowered (psychrophily) temperature, an acidic pH (acidophily) or increased salinity (halophily). When two or more types of extreme conditions are required, organisms are designated as polyextremophilic. This chapter deals with polyextremophilic photoautotrophic eukaryotic algae. 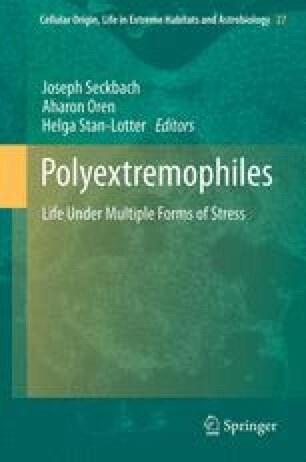 It discusses the meaning of the term extremophilic and gives examples for polyextremophily among ice and snow algae, among algae of hot or cold desert soils, and among algae living in habitats of high salinity or in hot and acid aqueous environments. A short survey is given on how research on extremophilic eukaryotic algae contributes to solving actual questions in the fields of biotechnology, evolution of life, and astrobiology.